$1,900.00 Magnificent Equestrian Sculpture, in bronze on marble depicting Marshal Kliment Voroshilov as a Red Army cavalry leader saluting his troops at the apex of his career. An exceptional work of Soviet statuary suited for the most advanced collection. $395.00 Magnificent Silumin alloy equestrian statue by Soviet sculptor Alexei Murzin of Vasily Chapayev, commander of the Red Army's 25th Infantry division during the Russian Civil War. The most iconic Bolshevik soldier of Soviet lore. 10 1/2" tall and in excellent condition. Circa 1975. 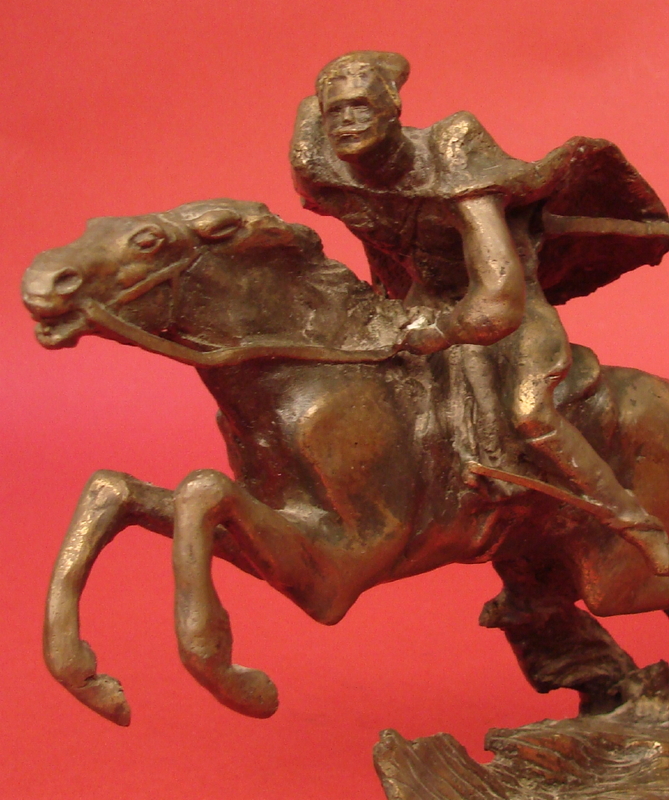 $220.00 Cast Bronze Statue of Vasiliy Ivanovich Chapayev, iconic Red cavalryman of the Russian Civil War. Very nice action pose on horseback. An impressive 10 ½ " long, piece of circa 1950s-60s vintage. $160.00 Young Lenin, a dynamic statuette in silumin alloy, circa 1970s-80s. $380.00 Solid Bronze Bust of Lenin on a Marble Plinth, circa 1950s- 60s. Weighing over 11 lb and standing nearly 10" tall, this extremely uncommon "deluxe" rendition probably once adorned the office of a high ranking Communist Party apparatchik or important state official - and was clearly a status symbol. In excellent condition. $290.00 Feliks Dzerzhinsky and Vladimir Lenin, 8½" full figure statuette in Silumin alloy, circa 1970s. The original artwork was created by the sculptor Aron Pliskin. This very impressive piece is far less common than the "singular" Lenin or Dzerzhinsky statuettes. In excellent condition. $75.00 Bust of Friedrich Engels in Silumin alloy, by Petrova, dated 1987. Karl Marx may not have succeeded in the the way that he did without this German's cooperation and support. Excellent condition. $240.00 Bust of "Iron Felix" Dzerzhinsky, ruthless founder of Cheka. Shows a 1982 date of manufacture and signature of the sculptor. A 10" tall casting in silver toned Silumin alloy showing him wearing his Order of the Red Banner. In excellent condition. $170.00 Bust of Feliks Dzerzhinsky, founder of Cheka (future KGB), dated 1984. A less common image by sculptor Teplov showing the architect of the "Red Terror" wearing military style visor cap with a star. In excellent condition. $140.00 Statuette of Feliks Dzerzhinsky, founder of Cheka (future KGB), circa 1970s-80s. An austere rendition in Silumin, 12" tall. $165.00 Sergei Kirov, large (13" tall) standing statuette in Silumin alloy, by sculptor Teplov, dated 1977. In excellent condition. $375.00 Massive Bronze Model of a Monument to Grigory Petrovsky, circa 1960s. Until very recently, the original monument had been a landmark in the city of Dnepropetrovsk (which had been named in honor of this early Bolshevik leader). Almost 11" tall, very heavy and impressive. $180.00 Russian Soldier and Worker Reading the Decree of Peace, full figure statuette in Silumin alloy, late 1960s - early 70s. This rather large and complex piece depicts a scene from the first days after the Bolshevik usurpation of power in November 1917. Very uncommon and nicely executed Socialism Realism sculpture in good overall condition. There is an engraved presentation from 1975 to a WW2 veteran on the plinth. $185.00 Soviet Stratonaut Statue, bronze plated miniature on a bakelite base of a dramatic statue commemorating brave Soviet fliers who died while flying high altitude research balloons into the stratosphere. Circa 1950-60s. Rare example of Soviet aeronautical memorabilia. $350.00 Yuri Gagarin, large bust in painted Silumin alloy, circa 1960s. Extremely uncommon early rendition. $80.00 Cosmonaut Gherman Titov, second man to orbit the earth, flew the Vostok 2 mission launched on August 6, 1961 and achieved 17 earth orbits. Silumin alloy bust, circa early 1960s. $195.00 Bust of Valentina Tereshkova (1937- ) in Silumin alloy, c 1960s. Stands about 6" tall. World famous Soviet Cosmonaut and the first woman to ever fly in outer space. $170.00 The Girl With an Oar, circa 1930s, one of several statues or statuettes done on a similar theme to exhort Soviet citizens to exercise and be healthy. $270.00 Lev (Leo) Tolstoy, 11 ¾" tall statuette in Silumin alloy, circa 1970s-80s. An interesting and unusual piece in excellent condition. $90.00 Bust of Mikhail Saltykov-Shchedrin, a prominent Russian writer and satirist. Circa 1970s-80s. A very uncommon bust. $125.00 Sergei Yesenin (1895 - 1925), Large 8" tall bust in Silumin alloy, dated 1980. One of the most famous Russian lyrical poets of the first quarter of the Twentieth Century. Wrote his final poem with his own blood. $120.00 Sergei Yesenin (1895 - 1925), bust in Silumin alloy, circa 1970s-80s. $120.00 Vladimir Mayakovskiy, Bust in silumin features a 1920s likeness of the famous Futurist poet, circa 1970s-80s. $240.00 Nikolai Ostrovsky, bust in Silumin alloy, circa 1970s-80s. An iconic image of the Socialist Realism writer who became famous for his loosely autobiographical Civil War novel "How the Steel Was Tampered". A very large and uncommon bust. $90.00 Bust of Maxim Gorky, dated 1981. $220.00 Unusual, 1975 Soviet made bust of Maxim Gorky, the famous author considered the father of Soviet literature and the originator of Socialist Realism. Large 9.5" x 7" size. Artistic rendering in thoughtful pose. $230.00 Maxim Gorky, full standing statuette in Silumin alloy, 11 ½ " tall, 1975. Very nice and uncommon rendition of the author generally considered the founder of Soviet literature and originator of Socialist Realism.